Mitchell Carlin with the first hit of the season for West Hills. SANTEE (3-12-16) — The West Hills Wolf Pack came out of the gate swinging in Friday’s (Mar. 11) Aztec-Foothiller Classic contest against the San Diego Cavers in a five inning game shortened by rain. Held hitless in their first two games, the Wolf Pack (1-2) racked up 10 hits, one of them a home run by senior CLAYTON LEWIS in the Wolf Pack’s 11-9 victory over San Diego. JEREMIAH BARR pitched 4 innings to log the victory for the Pack. LA JOLLA COUNTRY DAY 3, GROSSMONT 0 – The Foothillers wasted a complete game pitching effort by JAYDEN LOMBARDO against the visiting Torreys in Friday’s (Mar. 11) Aztec-Foothiller Classic action. Grossmont (2-1) had a major scoring threat after LJCD scored 3 runs in the second inning keyed by a two-run homer by A.J. Dhus. The Foothillers loaded the bases in the third inning on singles by STEVEN OUELLETTE and EVAN McCARTHY and a walk by ADAM LOPEZ. However, back to back strikeouts killed the rally. Grossmont tried to comeback in the inning but faltered. McCarthy was 3-for-3 and CALVIN FARRIS was also 3-for-3 in the losing cause for the Foothillers. 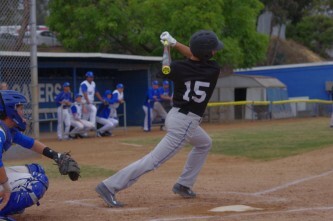 One of Farris’ hits was a double, but the Foothillers couldn’t connect on any of their hits at the prime time. The Barons (2-0) broke a scoreless tie with a run in the third, two in the fourth and one in the fifth to spoil the pitching of JUSTIN POE. Valhalla mustered only 3 hits in the losing cause. The Norsemen’s meager attack consisted of a double by COLE HENDERSON, a single by LEWIS DIRKES and a base hit by CALEB ST. CLAIR. In other rain-shortened games . . .
Mount Miguel was trailing Imperial 6-5 in the top of the fourth in a game that was suspended. Christian trailed San Ysidro 1-0 in a game that was rain shortened. Helix led Eastlake 5-1 in a game that was suspended by rain in the fourth inning. There is some discussion whether these games will be classified as suspended games that would be picked up in progress or re-started. Stay tuned. Wylie, Howe (6) and Petty. Lombardo and Hindorff. WP-Wylie (1-0). LP-Lombardo (0-1). HR-(LJCD-1) Dhus, 2nd, one on. Sv-Howe (1). Barr and N/A. San Diego battery N/A. WP-Barr (1-0). LP-N/A. Montoya, Akino (5) and Ballstein. Poe and Heider. WP-Montoya. LP-Poe (0-1). Sv-Akino. HR-(BV) Luna 3rd, solo.